Set of three vintage aluminum stools. Newly reupholstered in this gorgeous butterscotch leather. Stunning pair of vintage brass poufs or ottomans designed by Marge Carson. Newly reupholstered in custom velvet. The cushions pop up like a souffle. A great set for extra seating. 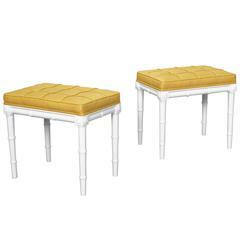 Gorgeous pair of vintage faux bamboo stools. Newly reupholstered in a knack mustard fabric. 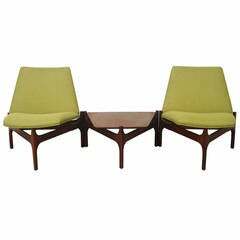 Vintage seating group designed by John Keal for Brown and Saltman.